How's this for a contrast? 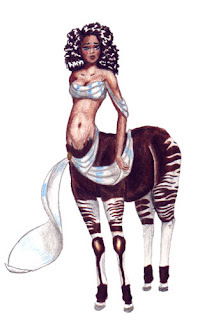 Deep in my harddrive I found this picture; a relic from my centaur-obsessed past. It must be from high school, making it like 8 years old! Interestingly, my style hasn't changed much since then. Not surprising, since I hardly drew at all during college. My degree was in genetics which had no requirement for drawing, and didn't leave much time for doodling. I don't think okapi's are known for intelligence though. They're just not very well know, period. They live in Africa, and are the giraffe's only close relative. My "Mammal Handbook" says they were initially known as "forest zebras" and it took the geniuses a while to figure out that they're a separate species.